The Arcata Police Department and other local law enforcement agencies will be partnering on Friday, April 20, to increase enforcement in and around Redwood Park. In past years Redwood Park, the Community Forest, and the surrounding neighborhoods have been negatively impacted by the gatherings that have occurred on April 20. 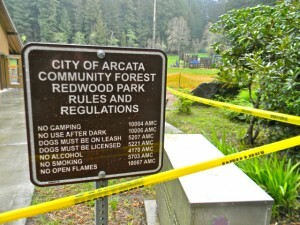 Law enforcement will be strictly enforcing all laws related to the use of Redwood Park. Smoking and alcohol consumption are prohibited. Redwood Park and the Arcata Community Forest are beautiful family friendly resources available to all community members. The Arcata Police Department and the City of Arcata encourage people to use Redwood Park and the Community Forest in a responsible and respectful manner. This entry was posted on Monday, April 16th, 2012 at 10:58 am	and is filed under News, Environment. You can follow any responses to this entry through the RSS 2.0 feed.